The remote viewfinder is an intuitive interactive remote control feature of the Gear 360 app. It lets you adjust the picture or video settings, preview the shot, and capture or record from a distance using your mobile device. Before you continue, your mobile device and the Gear 360 must be paired. Important: Make sure the Gear 360 is powered on and is connected to your mobile device. Note: You can take photos or record videos using a single lens or both lenses. To capture 360° media, use both lenses. 1 On your mobile device, navigate to Apps > Samsung Gear 360. • Dual: Capture 360° photos and videos using both cameras. • Front: Capture 180° photos and videos using the front camera. • Rear: Capture 180° photos and videos using the rear camera. Note: Live preview lets you line up the perfect shot. Important: The live preview functions and settings are only available in Dual Lens mode. To view the picture or video, touch Gallery. • 360° view: Fish-eye lens view that you can adjust by swiping. • Round view: Wraps the image around a circle, You can change the perspective by swiping. • Stretched view: The image is stretched to fit the screen. • Dual view: Displays previews of both cameras simultaneously. • Panoramic view: Displays the preview as a panorama. Note: The Gear 360 comes equipped with five shooting modes: Video, Photo, Time lapse, Video looping, and Landscape HDR. • Video: Record 180° or 360° videos. • Photo: Take 180° or 360° photos. • Time lapse: Record 180° or 360° time lapse videos. Set the interval between each picture, then all of the pictures will be combined into a time lapse video. • Video looping: Continuously record 180° or 360° videos without using up too much space. Your Gear 360 will record videos for the time limit you set. After the limit is reached, the Gear 360 will start recording over what you've just recorded from the beginning. 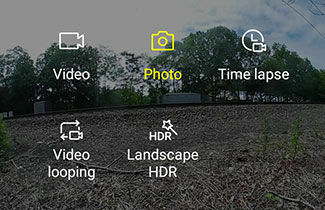 • Landscape HDR: Take multiple pictures at different exposures and combine them to create brighter 180° or 360° images. Note: With the remote viewfinder, you can take pictures or record videos from a distance. 3 Select the Lens and Shooting mode, and then adjust the camera settings. 4 When you are satisfied with the settings, touch Capture/Record. 5 To view the picture or video, touch Gallery. Gear 360 (2017): What shooting modes are available on my Samsung Gear 360 (SM-R210)?